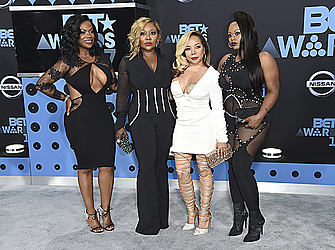 R&B girl group Xscape reunited on the BET Award stage for a performance that won over the audience nostalgic for '90s R&B. The foursome sang the popular hits "Just Kickin' It," ''Understanding" and "Who Can I Run To?" on Sunday at the Microsoft Theater in Los Angeles. The crowd was in awe, singing along and filming the performance with their phones. Kendrick Lamar also earned a loud applause when he joined Future for the Top 5 pop hit, "Mask Off." Mary J. Blige was also a favorite: She sang songs from "Strength of a Woman," her recent album that includes emotional tunes about her divorce. Solange, who had one of the last year's most critically acclaimed albums with "A Seat at the Table," won the Centric award and called Sunday "the best birthday ever." Solange turned 31 on Saturday and is nominated for video of the year at the performance-packed ceremony. "My arm pits are sweating so much right now," said Solange, who also thanked BET for showing her "queens" like Aaliyah, Missy Elliott, Erykah Badu and others during her teenage years. Solange held a moment of silence onstage later on, and the show also honored some of the minorities who died at the hands of police officers, including Trayvon Martin, Philando Castile, Eric Garner and others. Hip-hop trio Migos, who won best group, also won over the audience with its performances of the hits "Bad and Boujee," ''T-Shirt" and "Congratulations," with Post Malone. Chance the Rapper, and his mom, danced during the long set; as did Queen Latifah, Cardi B. and "Stranger Things" actor Caleb McLaughlin. An energetic Bruno Mars kicked off the show with a fun and funky performance of the song, "Perm." The pop star, whose last album was heavily inspired by '90s R&B, won best male R&B/pop artist. Mars was nominated for five awards — only behind Beyonce, who was up for seven honors and dominated last year's BET Awards. Mars, Migos and Solange are nominated for video of the year along with Beyonce and Big Sean. Beyonce, who reportedly had her twins earlier this month though she hasn't commented on the topic, is also nominated for best female R&B/pop artist, pitting her against her sister Solange, Mary J. Blige and Kehlani. Other strong competition Sunday include best female hip hop artist, where rivals Nicki Minaj and Remy Ma will go head-to-head. Minaj has won the honor consecutively since 2010. Other nominees include Elliott, Young Ma and Cardi B. Performers include DJ Khaled, Lil Wayne, Maxwell, New Edition and El DeBarge. Presenters include Queen Latifah, Trevor Noah, Jada Pinkett Smith, Issa Rae and Yara Shahidi. New Edition, who had success with their BET biopic this year, will receive the lifetime achievement award. Chance the Rapper won the best new artist award and will be presented the humanitarian award later in the ceremony. Leslie Jones of "Saturday Night Live" fame is hosting the show and offered jokes about contemporary rappers' names and her age (she turns 50 this year). The show is airing live on BET.